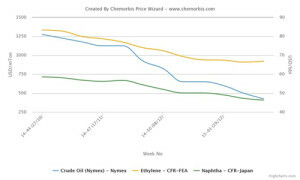 According to ChemOrbis, buyers and sellers in Asia’s PVC markets are holding divergent expectations regarding the direction of the market as sellers argue that the market is nearing the bottom while buyers counter that the market should have further room to decrease. Sellers base their hopes of stabilization on the fact that some major producers claim to be feeling free of inventory pressure while buyers argue that talk of market stabilization is not realistic given the ongoing declines in the upstream chain. 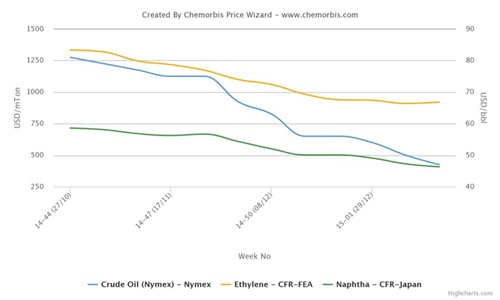 According to data from ChemOrbis Price Wizard, spot naphtha prices on a CFR Japan basis have come down by around $200/ton since the beginning of December while spot ethylene prices on a CFR Northeast Asia basis declined by approximately $180/ton over the same time frame. Crude oil futures on the NYMEX, meanwhile, have fallen from over $65/barrel at the start of January to around $45/barrel this week.